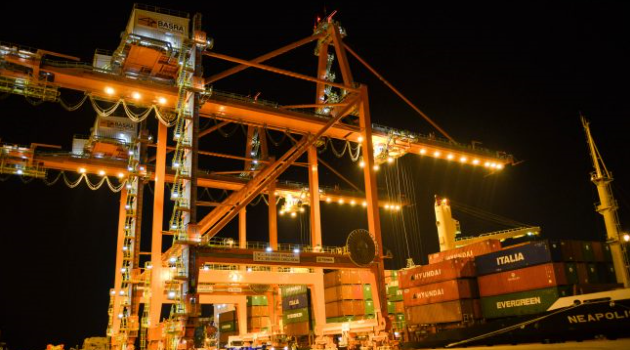 Philippines-based International Terminal Container Services Inc. (ICTSI) has reportedly allocated additional funds for capacity expansion at its Basra Gateway Terminal (BGT) at the Port of Umm Qasr. Rafael Consing, ICTSI chief financial officer, is quoted by the Philippine Daily Inquirer as saying that this year’s capex budget of $380 million will be invested at its four ports in Manila, Mexico, Honduras, and Iraq. Posted in Basra, Basra Gateway Terminal (BGT), Construction & Engineering In Iraq, featured, International Container Terminal Services Inc (ICTSI), Iraq Transportation News, mn, Philippines, Ports, Umm Qasr, Umm Qasr Port. The largest container vessel to dock at the Port of Umm Qasr has recently arrived at the Basra Gateway Terminal (BGT). According to Container Management Magazine, Evergreen’s 5,652 teu-capacity Ever Useful, with a length of 285 m, beam of 40 m and a weight of 69,246 tonnes, called at Berth 27 at the end of August. Situated in Umm Qasr, 50 km from Basra and 500km from Baghdad, BGT is operated by International Container Terminal Services Inc. (ICTSI). Posted in baghdad, Basra, Basra Gateway Terminal (BGT), Economy of Iraq, Evergreen, featured, International Container Terminal Services Inc (ICTSI), Iraq Transportation News, Ports, Umm Qasr Port. The Iraq Britain Business Council (IBBC) has announced that Basra Gateway Terminal (BGT) has joined the Council. BGT is one of Iraq’s premier container and multi-purpose cargo handling facility, with a team of high-performing Iraqi and International port professionals who deliver customer-focused, high productivity and congestion-free port services to Iraq’s economy. Situated in Umm Qasr, 50 km from Basra and 500km from Baghdad, the Terminal is operated by International Container Terminal Services Inc. (ICTSI). ICTSI is an internationally recognized expert in port construction, operation and management with more than 30 years of experience. It is one of the major maritime terminal operators in the world present in 6 continents, operating 30 marine terminals in 20 countries positioned in some of the world’s most strategic trade lanes. ICTSI is half way through a USD 230 million investment programme, which includes rehabilitation and operation of the port’s existing facility at Berth 20 and construction of three new berths at Berth 25, 26 and 27. In 2017, BGT was extended to perform the operation at Berth 19 and 21 for general cargo and RORO cargo respectively hence helping BGT to launch itself in the project cargo for oil and gas sector business. These investments have been supported by the introduction of state-of-the-art technology in Iraq’s port sector with BGT being the first terminal to introduce the SAP ERM system and the Navis Sparcs N4 Terminal Operating System. Posted in baghdad, Basra, Basra Gateway Terminal (BGT), Business, featured, General Company of Iraqi Ports, International Container Terminal Services Inc (ICTSI), Iraq Britain Business Council (IBBC), Iraq Industry & Trade News, Iraq Transportation News, Umm Qasr, Umm Qasr Port, United Kingdom. 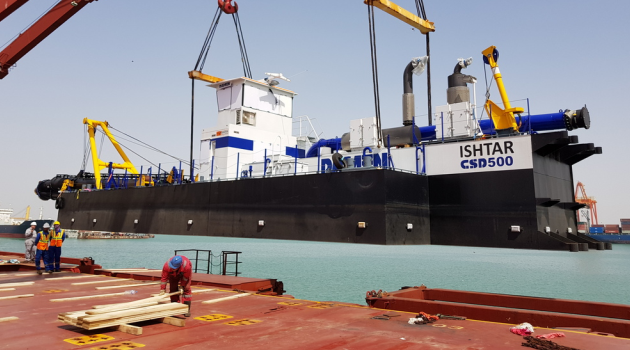 A customised Damen cutter suction dredger, type CSD500, has been named by her owner, Basra Gateway Terminal (BGT), at the Damen Dredging yard in the Netherlands. Immediately after the ceremony, the dredger was made ready for transport and towed to Rotterdam, from where it was shipped to Port of Umm Qasr, Iraq. The dredger’s first job will be the port extension for Basra Gataway Terminal. The blessing ceremony took place the 9th of January, when the stationary dredger received the name Ishtar – which translates as ‘Goddess of Love’. “We are proud to take delivery of our new cutter suction dredger. We have bought if from stock for short lead times, and have added a number of options, customising the CSD making it the perfect dredger for the job. The CSD500 will work on the extension project of the Basra Gateway Terminal, at the Port of Umm Qasr, Iraq. The terminal operator, International Container Terminal Services, Inc. (ICTSI) has started an ambitious port enlargement project. This port expansion has now reached the second phase, starting on deepening of the container terminal using the CSD500 Ishtar. It total some 400 metres of quay wall will be added to the port capacity. Basra Gataway Terminal is supported by Dredge Maritime Consultancy for the on-site project management and project execution. To maximise the production of the dredger, Damen added a spud carriage pontoon and anchor booms. Moreover, a fully equipped accommodation unit was placed under the operating cabin. The cutter ladder was extended for a max dredging depth of -16 metres. To ensure immediate start up on site, the delivery includes a swivel hose as well as 400 metres of floating pipe line. Damen prepared the suction dredger for transport and arranged towage to Rotterdam. The spud carriage pontoon and the eight containers with the pipe line followed separately. 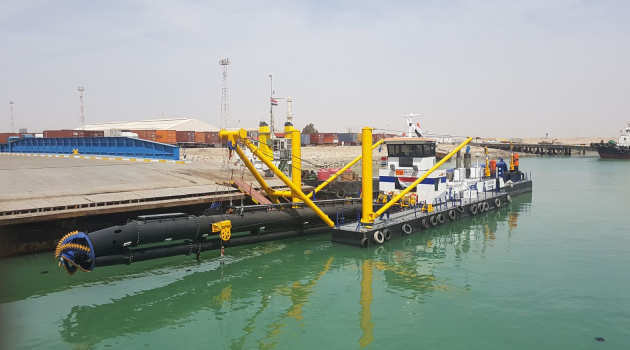 The complete delivery from Rotterdam to Port of Umm Qasr is a good example of a complete turnkey package delivery of fully customised dredger with a minimal lead time. Posted in Basra, Basra Gateway Terminal (BGT), Business, Construction & Engineering In Iraq, Damen, Dredge Maritime Consultancy, featured, International Container Terminal Services Inc (ICTSI), Netherlands, Umm Qasr. Philippines-based International Container Terminal Services, Inc. (ICTSI) has started its second phase investment in new container terminal infrastructure well underway at its Basra Gateway Terminal (BGT) at the Port of Umm Qasr. ICTSI is unique in demonstrating its commitment to the Iraqi ports sector via large scale investment in new terminal infrastructure and container handling systems. On completion of the current second phase expansion scheme, ICTSI will have invested in excess of USD250 million, the lion’s share of which is for a new berth, yard construction, and state-of-the-art handling equipment. The phase two expansion, to be completed in stages by Q3 2019, will deliver 400 meters of new quay with a draft of 14 meters, alongside a new 30-hectare yard area and a 15-hectare secure parking area. Three post-Panamax ship-to-shore cranes would likewise be installed along the quay, and seven rubber tired gantries (RTG) will provide state-of-the-art stacking and handling power in the yard area. The overall design provides for handling container vessels of up to 9,000 TEU capacity. Upon completion of the second phase, BGT will have an annual handling capacity of over one million TEUs. The second phase development was triggered by strong demand, a reflection of the high service levels and modern facilities offered by BGT to shipping lines and cargo owners. Underlining BGT’s ongoing commitment to maintaining high service levels, the latest round of development also includes the acquisition of a cutter suction dredger with the dual objective of ensuring strict adherence to the construction schedule and maintaining draft alongside the terminal’s new and existing births. “We are listening to our customers and are proactively meeting their needs,” says Phillip Marsham, BGT executive officer. “The second phase expansion will not only allow us to respond immediately to scale needs, but also deliver added flexibility to the whole container handling operation with diverse benefits flowing to our customers,” he adds. In Q1 2017, BGT completed the first phase of its terminal greenfield project, which included the construction of a new 250-meter berth and a 15-hectare yard area. “Our commitment to helping Iraq develop international standard port infrastructure continues to expand,” says Hans-Ole Madsen, ICTSI senior vice president and regional head of Europe, Middle East, and Africa. ICTSI’s USD250 million investment in BGT will progressively deliver world-class multipurpose cargo handling facilities and unparalleled efficiencies to the Port of Umm Qasr, including the capability to service larger, new generation box ships. International Container Terminal Services, Inc. (ICTSI) continues its pioneering work in Iraq’s port sector with its second phase investment in new container terminal infrastructure well underway at its Basra Gateway Terminal (BGT) at the Port of Umm Qasr. Posted in Basra, Basra Gateway Terminal (BGT), Construction & Engineering In Iraq, DJ, featured, International Container Terminal Services Inc (ICTSI), Iraq Transportation News, Philippines, Ports, Umm Qasr. The International Container Terminal Services Inc. (ICTSI) has signed the Expansion Agreement for the second major development phase of the Basra Gateway Terminal (BGT) in North Port, Umm Qasr, Iraq. Two new berths will be developed incorporating a 20 hectare yard area thereby raising annual BGT container handling capacity by 600,000 TEU to a total of 1,200,000 TEU. The berths will be configured and equipped with quay and landside container handling systems so as to be able to handle container vessels of up to 10,000TEU. Combined with the adjacent Berth 27, it will offer a continuous berthing line of 600m. “This new USD100 million investment follows hot on the heels of ICTSI’s development of Berth 27 and the rehabilitation and upgrade of berths 19, 20 & 21, a USD150 million investment. Our commitment to provide international standard port facilities and services in Iraq is plain to see. “It also represents the fruit of a positive working relationship with the Iraq Ministry of Transport, General Company for Ports of Iraq (GCPI) and Governorate of Basra as well as other government agencies. Other signatories to the Expansion Agreement were: Chief Riyadh, GCPI Director, and Eng. Ali Kh. Khalaf, Basra Mas CEO. The new USD100 million investment will be undertaken by ICTSI subsidiary BGT with construction scheduled to start immediately. When fully developed, Berths 25, 26 and 27 will offer a continuous 600m berthing line and 50 hectares of yard area. The new container handling systems will work in conjunction with state-of-the-art terminal operating systems and benefit from ongoing staff training and continuous improvement of systems. “BGT has raised the bar in container handling service in Umm Qasr and Iraq as a whole. The new berths will, through both capacity expansion and the installation of modern infrastructure and handling systems, open the door to even higher levels of efficiency. Posted in Basra, Basra Gateway Terminal (BGT), Basra News, Construction & Engineering In Iraq, International Container Terminal Services Inc (ICTSI), Iraq Transportation News, Ports. Philippines-based International Container Terminal Services Inc. (ICTSI) has said it has increased its volumes by 12 percent over the past year, mainly due to the continuing volume ramp-up at its terminal at Umm Qasr port. The company inaugurated the first phase of its $130-million greenfield port development at Basra Gateway Terminal (BGT) in October. Posted in Basra, Basra Gateway Terminal (BGT), Business, DJ, featured, International Container Terminal Services Inc (ICTSI), Iraq Industry & Trade News, Iraq Transportation News, Philippines, Ports, Umm Qasr, Umm Qasr Port. The Philippine embassy in Baghdad has said that the recent opening of ICTSI‘s $130-million port development in Basra opens further possible opportunities in construction and the oil and gas sectors. In a statement, Chargé d’Affaires Elmer Cato (pictured) expressed the hope that more Filipino companies would explore investment opportunities in Iraq. Posted in baghdad, Basra, Basra Gateway Terminal (BGT), Business, featured, International Container Terminal Services Inc (ICTSI), Investment, Iraq Industry & Trade News, Iraq Transportation News, Philippines. Sweden’s JLT Mobile Computers has announced that it has successfully delivered a total of 50 JLT VERSO 12 mobile computers to the Basra Gateway Terminal (BGT). BGT, a container and multi-purpose cargo handling facility at the port of Umm Qasr, is operated by Philippines-based International Container Terminal Services Inc. (ICTSI); it opened an extension to its facility on 12th October, with the first container lifted by one of two new ship-to-shore cranes during the opening ceremony. In this part of the Middle East, temperatures can reach the extremes on a daily basis, so it’s essential that the computers used can withstand this environment to ensure that operations keep running seamlessly. Any interruption in service, however small, can have massive knock-on effects on productivity. “Basra Gateway Terminal has one of the harshest operating environments for a port terminal in the world. “This summer, we recorded a temperature of 53°C, the hottest in the Western Hemisphere. During that time the JLT VERSO 12 computers, which are not used in air conditioned environments, kept working. Posted in Basra, Basra Gateway Terminal (BGT), Basra News, Business, Construction & Engineering In Iraq, DJ, featured, International Container Terminal Services Inc (ICTSI), Iraqi Communications News, JLT Mobile Computers, Sweden, Umm Qasr, Umm Qasr Port. International Container Terminal Services (ICTSI) has officially inaugurated the first phase of its new $130-million greenfield port development at Basra Gateway Terminal (BGT) in Umm Qasr. Iraq’s Minister of Transport, Kadhem Finjan al-Hamami, attended the ceremony along with ICTSI chairman and president, Enrique K. Razon Jr. The Philippines-based company signed a 26-year concession with the General Company for Ports of Iraq (GCPI) in 2014 to develop and operate three new berths, in addition to a 10-year agreement to redevelop the existing container terminal at Berth 20. According to the report from Seatrade Maritime, when fully developed, the new terminal area will comprise 600 meters of quay and 50 hectares of yard area, complementing bulk and general cargo facilities at berth 19 which ICTSI was contracted to manage earlier this year. Posted in Basra, Basra Gateway Terminal (BGT), Construction & Engineering In Iraq, featured, General Company of Iraqi Ports, International Container Terminal Services Inc (ICTSI), Iraq Industry & Trade News, Iraq Transportation News, Philippines, Ports, Umm Qasr Port.